Technology - Traylek Warehouse Inc. Inventory management and invoicing is implemented from our WMS. 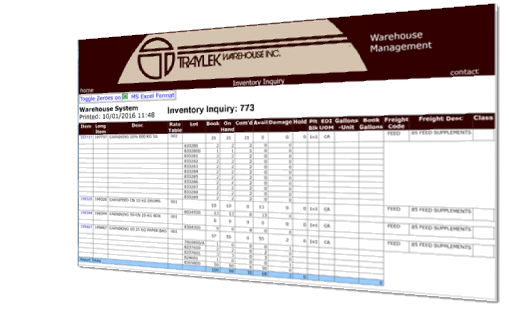 First implemented over 20 years ago, with constant improvements in software and hardware, Traylek provides best in class visibility to your inventory from our Customer Portal. Contact the sales team at Traylek to learn more. Creating solutions using our extensive industry experience, or, with technology is where Traylek excels. From labeling to EDI to systems integrations via API, we can create the right strategy to solve your logistics challenges.